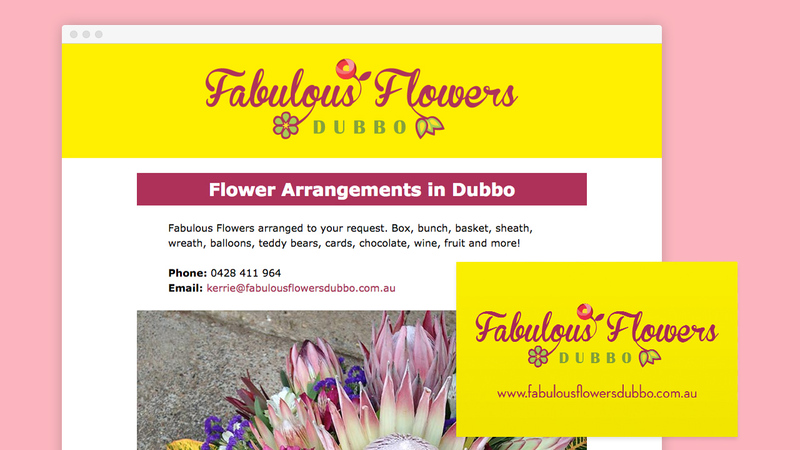 Kerrie started Fabulous Flowers Dubbo in 2013 providing flower arrangements for any occasion. Using native flowers grown on a family farm and other flowers sourced daily from a local supplier Kerrie creates amazing displays of floral beauty. Kerrie reached out to Warble Media to handle the branding of her new business. The brief was something elegant that popped. Starting with a cursive typeface we augmented the logo with floral ornaments. A deep maroon was chosen to stand out from the crowd. Alongside the logo, we produced a stunning business card design. Backing the logo with a brilliant yellow, we produced business cards the truly pop and capture your eye at first glance. To tie it all off, we created a simple landing page website with details about the services offered and contact details. The website is also the perfect platform for Kerrie to display some of her arrangements and bouquets. We’ve got plenty more where that came from!